Stop and Smell the Chocolates: I.Am.Not.Ready.For.Christmas. This is nothing new - I say it every year. 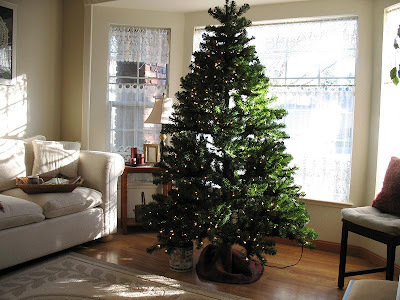 In 2008, I posted about how I wasn't ready for Christmas - on December 16! In 2010, I posted my "last" post on December 6 (That only lasted 4 months or so - LOL! ), so you never heard about how I decorated my tree just a day or 2 before Christmas! Oh I forgot to mention - we DO have icicle lights on the outside of the house because my hubs rocks! And we DO have Christmas gifts for the kiddo. So that's something. I think this Saturday is free so maybe I can get caught up to where I want to be! So, how many of you have all your decorating, shopping, and card-sending done? How many of you dare to confess that you're as behind as me (if there are *any*)? Of course, my family knows that even if there are no decorations, or goodies, or pictures, or cards, or music, or gifts - it does not take away from the joy in our hearts and the reason for the season, Jesus! Have a blessed, joy-filled, and productive day friends!! Well we are officially done with the decorating. I believe I'm done with the shopping except for maybe a couple of things but I haven't sent out one card yet and we haven't taken our annual Christmas picture yet. I think we should move Thanksgiving to the beginning of November so we have a bit more time between holidays. That's just my thought. Big knowing the real meaning of Christmas is the most important thing and the rest is just the fluffy fun, like sprinkles on top of ice cream size hugs to you! I'm not done! But I think I'm calling it done! LOL! I haven't put up nearly as much as I usually do, but I think I'm stopping with what I 've done instead of stressing to push myself! As you said ...life gets in the way! :) And I love your last point about the true meaning of Christmas ...no decorations or not! My house is decorated, but I do that right after Thanksgiving so that the Jesse tree and advent wreath are ready to go... and I love to have my house decorated. But only one gift has been bought!!!! I will make you feel better... We have close to zero decorations up right now. I am hoping to do that this weekend. I have already accepted the fact that we will not do outdoor lights. Done! We are hoping to do some online shopping tonight. I also have to order my photo cards - hurry! So... don't feel bad... I'm there with ya! :-) Christmas always approaches faster than I can think, so I just try to simplify and do what I REALLY want to do and what we REALLY can do. Well I found through the years when my kids were little I always went over board, started shopping in October, bought to much, had way to much wrapping to do, just more trash and before recycling, (could of saved a tree) decorated the week before Thanksgiving, the poor tree dried out (when we used a real tree)and then left it through New Years,ug. I think I enjoyed all the hustle and bustle but we all know the true meaning of Christmas! Then I would get sick because I was worn ragged, not a good way to start the new year. So take your time, do what you can do, dont and enjoy your family! !